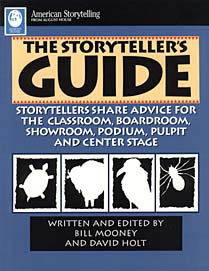 The Storyteller’s Guide reveals the nation’s top storytellers’ best tips on the storytelling craft. This comprehensive guide to storytelling features interviews with more than fifty storytellers teachers, librarians, authors, musicians, actors, clergymen and full-time professionals. Perfect for the classroom, boardroom, showroom, podium, pulpit or center stage.